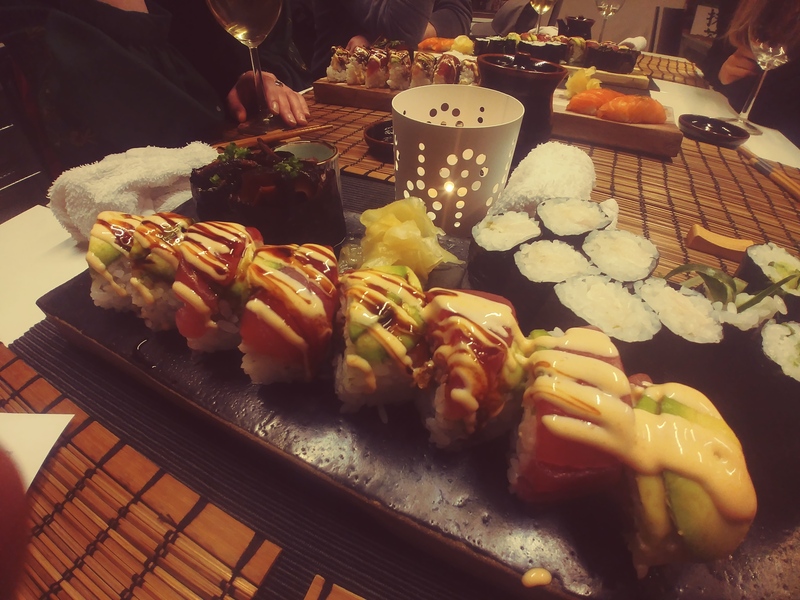 There is a new monthly pop-up restaurant in Brno serving Japanese food, sushi in particular, at Bistro Prameniště on Špitálka 37. As a side note – why oh why oh why has nobody opened a Japanese restaurant on Sušilova? The bistro is unassuming from the outside, and pretty unassuming on the inside, too. When we were there it was surprisingly quiet, in fact, once we were the only ones there, which didn’t help the atmosphere much. I think that may have been unlucky timing on our part, but the room itself doesn’t help, the walls are quite bare, and consequently the sound echoes so as to amplify the silence. One of my dining companions uncharitably remarked that the ambiance reminded her of Christmas dinner in a nursing home. That we were alone is surprising when you consider that the event typically sells out weeks in advance: If you want the full experience you need to pre-book your sushi set online (details available through the Sushi Day Facebook event page), and there are a limited number that usually sell out quickly. But if you catch a peek inside the kitchen it becomes clear what makes this venue attractive – the kitchen is large, and fitted with many gleaming steel work surfaces giving lots of space for preparation. The sushi is prepared fresh as it goes out the kitchen, so if you have a lot of orders going to the same table, you should be aware you‘ll probably have to wait a bit. Whilst we waited I ordered some of the cone shaped temaki from the day menu, and some sake to drink. The sake was gently warmed, and slightly sweet, yet the mildly bitter chlorophyll taste made it refreshing, like a green tea martini. I got the salmon temaki, and whilst I’m not usually a salmon fan, these were superb. With only the mildest of salmony taste, beautiful squidgy elastic rice, swaddled in a sheet of seaweed that seemed to pop open and decant the innards as I bit down on it. 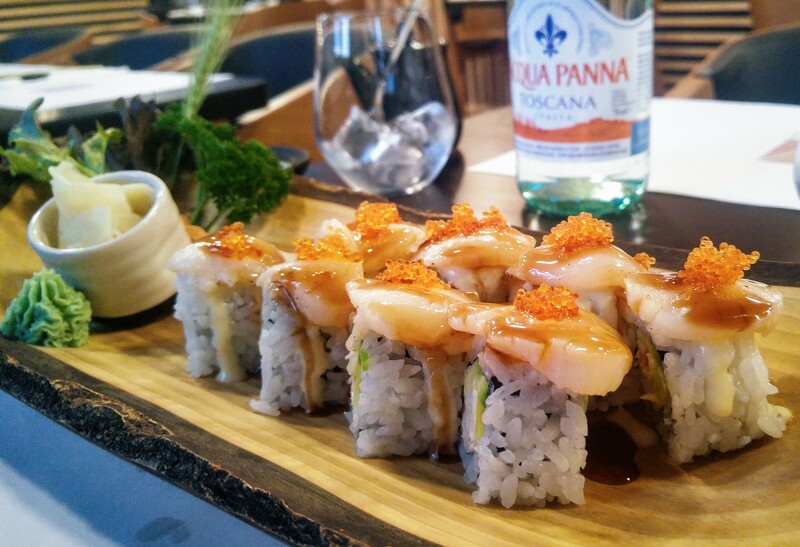 This is one of the dishes available on the menu you can order from if you turn up without having a pre-booked sushi set. It’s small, but everything I’ve tried from it has been delicious, and makes it worth a visit for those dishes alone. The sushi platter that I’d ordered came out and looked beautiful. We were advised to start with the shiitake mushroom nigiri, which we did and which were great. The tea smoked salmon nigiri were also excellent, but everyone agreed the real highlight was the house sushi, the M & M rolls (named for the couple who invented them), which are avocado, tuna, salmon, with various sauces and something inside that gives them a crunch – a welcome contrast to sushi’s usually uniform softness. 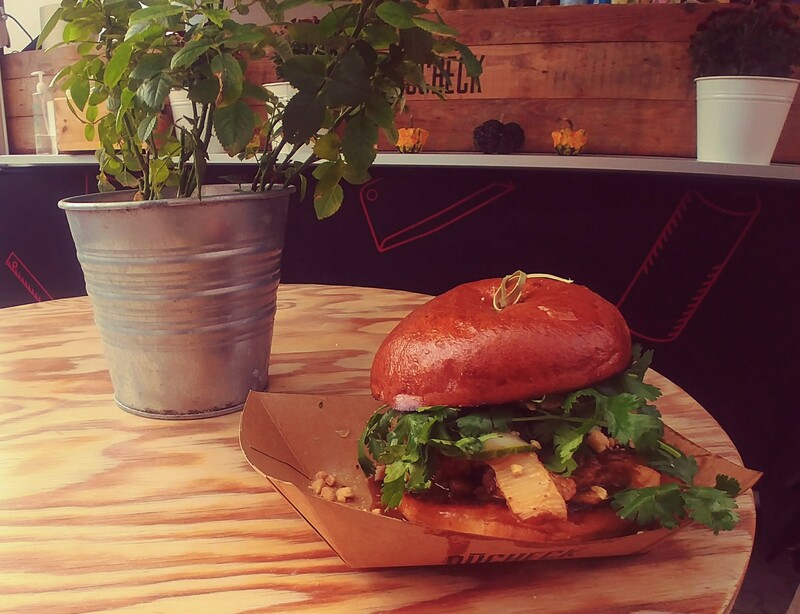 Whilst the ambiance can be a bit lacking, there is a real sense that the food is prepared by people with a passion for what they’re doing. I wouldn’t pick it as the spot for a romantic anniversary date, but for those who want to try high-quality sushi in an informal setting, this is ideal. When you go somewhere to eat a specific type of food, and it’s so extraordinary as to make everything else taste underwhelming, that’s something worth noting. My only warning would be maybe don’t come here if you don’t want to immediately feel dissatisfied with “ordinary” sushi. How much Czech could a buček check if a buček could check Czech? Huddled in an alley out of Zelný Trh, cloaked in the shadows and dressed in black awaits one of Brno’s very few food trucks. Bucheck isn’t just a meal, it’s a way of life. 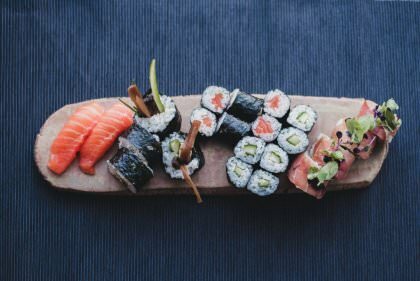 There are 66 different sushi rolls on the menu, and besides having the recognisable classics they have a large selection of unconventional fusion recipes.